The term Industry 4.0 refers to the use of information and communication technologies for production and automation. The digitisation and networking of processes from the corporate management level right down to the sensor, actuator and the workpiece, even across factory and company borders, provides great potential for value creation. The key lies in the flexibility and increased efficiency of the production process and in the engineering of products and production facilities. An essential requirement of manufacturing companies is the high availability of production processes in order to make the best possible use of production facilities and so ensure competitiveness. Disruptions or even failures of such facilities are usually associated with high follow-on costs. Industry 4.0 creates the basis for technologies and solutions that enable manufacturing companies to identify shortcomings and imminent disruptions in their production processes at an early stage, giving them sufficient time to take action before a failure occurs. The concepts “condition monitoring” and “diagnostics” combine various technologies to enable the status of processes and production systems to be continuously monitored, changes to be detected and give advice on how to optimise them. Information transparency is currently considered to be unsatisfactory. This means that the impact of the operating conditions on the service life of the electronics is often not known. While errors can be detected, if is often without precise information on the affected equipment or its location. If malfunctions do exist, they can often only be diagnosed via local signalling or even group alarms. Determining causes and corrective measures is usually costly and time consuming. And finally, maintenance, i.e. control or calibration, is currently performed at fixed time intervals, regardless of actual usage. The implementation of information transparency poses several challenges. It is often the case that not all the available information is transferred to higher levels, just the control-relevant data. Important status information for system diagnostics often remains hidden at the field level. Furthermore, although information is escalated via communication chains, accessing the control variables often involves extra work. It is also frequently necessary to convert protocols and modify data. Finally, there is a lack of manufacturer-independent standards. 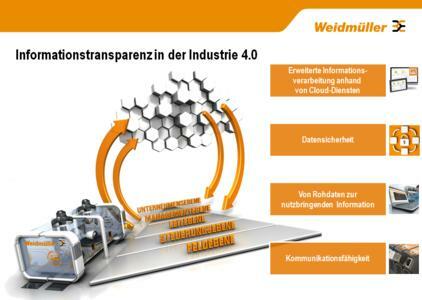 Information transparency with Industry 4.0, on the other hand, has the following elements: enhanced cloud-based information processing, implemented end-to-end data security, conversion of raw data to useful information and communication-enabled processes and systems. The core functions of Industry 4.0 are therefore digitisation, networking, analysis in superordinate IT systems, derivation of optimisation measures and feedback from processes. Modern production systems are therefore associated with increasingly complex structures and extremely elaborate automation designs. As a partner in Industrial Connectivity Weidmüller is driving forward the intelligent networking of production. This can be illustrated by a number of real-life examples. The “Energy-efficient process optimisation through condition monitoring and diagnosis” demonstration machine is a conventional injection moulding machine that is incorporated into an Industrial Ethernet production network using communication-enabled components. The built-in power monitor measures and records all the relevant electrical parameters of the machine and makes them available to the energy management system. 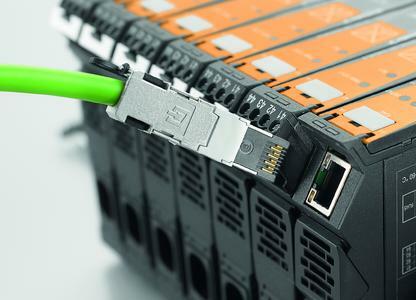 Communication-enabled ACT20C signal converters convert analogue machine data into digital data, which is subsequently processed and analysed in the cloud. ACT20C modules can be integrated into Industrial Ethernet structures thanks to their communication interface. What is remarkable about the signal converters is that they include comprehensive diagnostic functions in addition to typical functions such as signal acquisition, preparation, standardisation and output. The subsequent transfer of data to the cloud enables production and manufacturing data to be adapted together with other information such as current energy prices, and thus provides complete transparency of all production data. Another advantage of ACT 20 C signal converters is that they can be integrated via Ethernet interface directly into existing Industrial Ethernet structures. Weidmüller system solutions consist of network components, the u-remote remote I/O system, including integrated web server, additional communication-enabled automation components and, not least, the u-link web-based remote support solution. u-link facilitates the custom design of remote maintenance solutions and is synonymous with high-level machine availability, simplified service and increased plant productivity. The more comprehensive the design of remote maintenance solutions for machines and systems, the more complex and time-consuming their management tends to be. 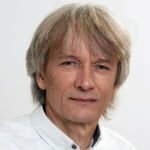 The two major challenges are the creation of dedicated, secure functional connections to the existing IT systems and the emergence of increasingly globally networked systems. For many users, each of these pose major hurdles. u-link was designed as a web-based remote maintenance solution and provides impressive simple, fast and secure access to machines and systems. The intuitive interface of u-link can be configured to match the system and quickly customised to meet specific design requirements. In addition to an innovative cloud service running on secure, high-availability servers in Germany, u-link also provides an online platform with secure “containers”, i.e. data is protected from being accessed by “third parties”. Even comprehensive remote maintenance solutions can be set up inexpensively and securely with u-link. The simple management of multiple manufacturing facilities and users is facilitated by a clear, transparent structure and system-specific individual rights management. The open-ended u-link remote maintenance solution is able to register any number of routers and users on the portal, adding more as and when required. In this way u-link can be optimally adapted to meet the needs of an ever changing and growing company. 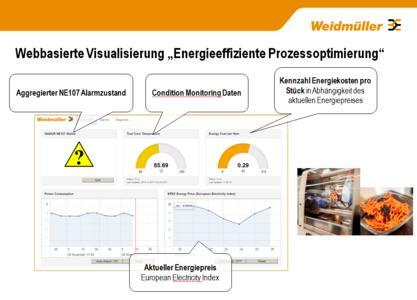 Weidmüller helps companies to comply with the Federal Act on Energy Services and other Energy Efficiency Measures (EDL-G), which entered into force in April 2015. The law stipulates that all companies not classified as small or medium sized enterprises (SMEs) are required to perform an energy audit in accordance with the requirements of DIN EN 16247-1 by 5 December 2015, or to have introduced a certified energy management system. Weidmüller provides a three-tier system of energy management. This energy management system enables companies to achieve sustainable reductions in their energy costs: Weidmüller offers both its proven, intelligent network-enabled hardware components as well as sophisticated energy controlling software and comprehensive advice to companies. The latter begins with a needs assessment, continuing with proposals for the measurement and visualisation of energy data through to the detailed planning and implementation of energy management. A further example is the implementation of an infrastructure box for the distribution of power, signals and data in future modular Industry 4.0 systems, meeting the highest demands for data security. 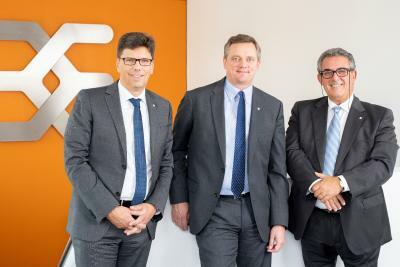 Weidmüller is implementing this project in the SmartFactoryKL eV consortium, a manufacturer-independent technology initiative of the German Research Centre for Artificial Intelligence (DFKI). 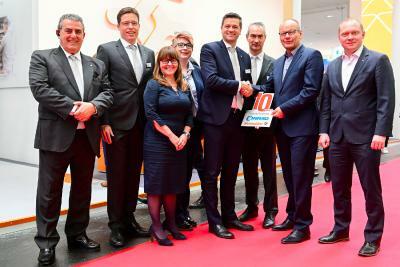 Weidmüller is building the box in collaboration with Belden/Hirschmann. 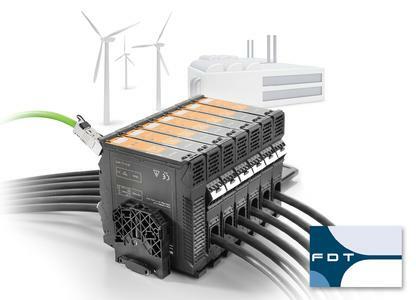 A combination of plug-and-play capability, precision fit for a whole range of system topologies and integrated energy measurement using Weidmüller components enables the construction of a flexible and transparent infrastructure solution – precisely in line with the core requirements of an Industry 4.0 designed versatile production process. SmartFactoryKL is an illustration of an intelligent infrastructure, in other words a modular, manufacturer-independent production facility that puts into practice the key aspects of Industry 4.0. Its focus lies on the networking of heterogeneous systems from different manufacturers through the use of common standards. It also shows how appropriate degrees of migration can already be used to implement the central aspects of Industry 4.0. 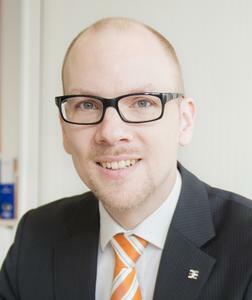 Web technologies are a key component of Industry 4.0. Today's web servers offer extensive options and can be smartly integrated into products direct from the factory. 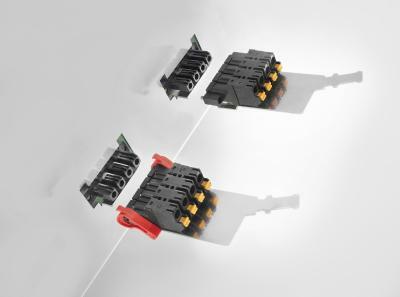 A web server integrated in the Weidmüller fieldbus coupler with its intuitively designed user interface can be used to carry out tests locally or remotely, whether it is remote diagnostics, the simulation of inputs or the forcing of outputs locally. 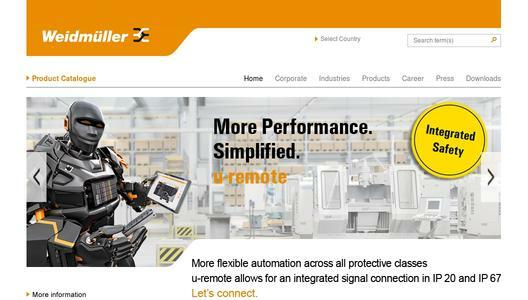 u-remote, Weidmüller’s remote I/O system, does not require any special software for this, just a standard browser. Processes and procedures can be simulated without a connected controller; this even applies to the retrieval of status information, diagnostics and process data. In addition to a simplified phased commissioning, this also speeds up servicing in the event of any unplanned system downtime. The web server design impresses with its high degree of user-friendliness and simple configuration, especially when it comes to serial machines. Requiring no additional hardware or program installations, users can configure and parameterise the I/O station both easily and conveniently. 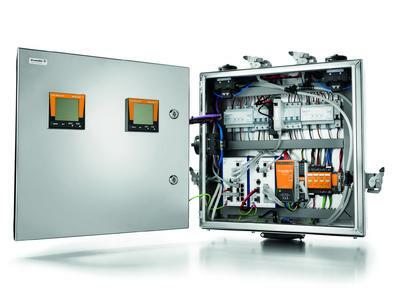 The Weidmüller-developed ACT20C gateway in conjunction with a current measuring transducer module supplies precise diagnostics and status information on devices used in various areas of automation, while performing preventive monitoring of systems and processes. In this way, the ACT20C modules play a big part in optimising the control of processes. With the ACT20C gateway and communication-enabled signal converters from Weidmüller it is now possible to obtain comprehensive information directly at the signal conversion level – regardless of the automation solution selected. An Ethernet interface provides easy access to the desired information: the data acquired by the ACT20C gateway is processed by Modbus TCP or can be displayed directly in an FDT frame application. The software configuration of the modules is based on FDT and FDT2 standards. 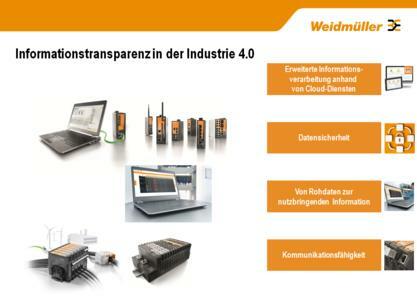 Since its presentation at Hannover Messe 2011, both production and automation have been occupied with Industry 4.0. The concept refers to the use of information and communication technologies for machines and systems, based on a symbiosis of information technology and engineering and adapted to the environmental conditions and requirements of the user. The term industry 4.0 also involves a paradigm shift that redefines the value creation and business models of manufacturing companies. That this has long ceased to be an empty vision is borne out by the examples given. They pinpoint key areas such as condition monitoring and diagnostics, the web-based remote maintenance solution for increased machine and plant availability, information transparency and communication capability as well as the infrastructure of future systems. The solutions presented here are an important step in this direction and help to make Industry 4.0 more comprehensible. power, signals and data in the industrial environment. – Let’s connect.